The medical profession today takes place in a very fast-paced environment. Doctors, nurses, and hospital staff are always on the go, and the equipment that they need to provide quality care for patients need to be by their side at every moment. Healthcare needs change from patient to patient. Care providers need equipment that can make their daily processes easier instead of having to work around outdated equipment that inhibits their ability to care for patients. Here at Scott- Clark Medical, we provide medical supply carts with drawers to medical and industrial professionals, allowing for freedom to take their equipment throughout the building and not be limited or confined to one area. Important tools and medical supplies are always accessible if you use a cart. This not only saves time but can ensure that precious seconds or minutes are not lost due to lack of proper equipment in the event of an emergency. By limiting the amount of plastic on the surface of our products, we help minimize the risk of infection via pathogens, such as MRSI. Our carts are also extremely customizable. Clients can specify detailed requirements for their facility, and Scott-Clark Medical will find innovative solutions to fit their day-to-day needs and operations. Our carts are built to ensure that every possible square inch of space is utilized. There is plenty of space for equipment of many shapes and sizes. 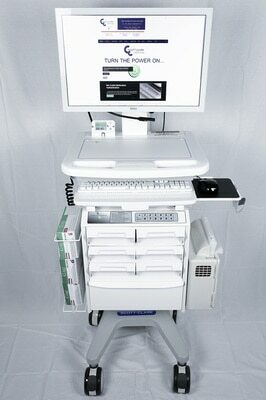 All medical tools and devices can be kept organized and readily available should the need arise. Scott-Clark provides reliable cart power and battery management systems, point of care medication workstations, and offers a patented Flexible Mobile Cart Power Technology System to ensure you always have power when you need it. Contact us today by calling or filling out our convenient online form.